Living with chronic back pain isn’t normal; however, the number of people suffering from back pain is on the rise. 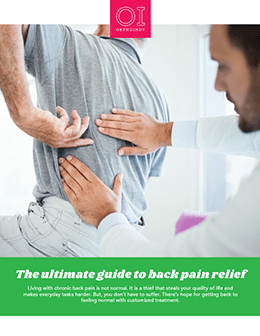 In fact, researchers at the Centers for Disease Control and Prevention cite low back pain as the second leading cause of disability in the United States, and the latest numbers indicate that an estimated 31 million Americans are experiencing low-back pain at any time, according to the American Chiropractic Association. If you are experiencing back pain, the first step to recovery is figuring out what is wrong. At OrthoIndy, our team of experts uses the latest technology in surgical and non-surgical treatments to treat your spine. The OrthoIndy Spine team consists of fellowship-trained, board certified spine surgeons, trained to treat injuries and conditions of the back and neck. To help you find relief from back pain, the spine doctors at OrthoIndy are now offering FREE reviews of your spine scans. Dr. Gabriel Jackson, spine surgeon at OrthoIndy believes this service will be valuable to individuals who are unsure of a treatment plan for back pain. In the past 12 months, if you or a family member had an MRI of the spine completed at another facility, you can request your scan be reviewed without ever coming into our office or scheduling an appointment. Your images will be reviewed first hand by a spine surgeon, who will provide you with a diagnosis. Should you need treatment, the surgeon will let you know if it would be best for you to make your first appointment with a physiatrist, also referred to as a physical medicine and rehabilitation specialist or non-operative pain management doctor, or with a spine surgeon. To start the process, please fill out our online form. You will need to obtain the images from the facility who performed the MRI. Once OrthoIndy receives the scans, one of our spine doctors will review your image and provide a diagnosis so you can better understand your condition and choose the best treatment option. If treatment is needed, the OrthoIndy Spine team would be happy to schedule an appointment to start your personalized treatment plan. OrthoIndy offers non-operative and surgical treatment options to treat your spine injury or condition. Patients should know that having your spine images reviewed by an OrthoIndy spine surgeon will provide you with valuable information about your condition and may make obtaining the appropriate care for your problem easier. However, the review of your images is NOT a diagnosis and is NOT a substitute for being seen by a physician in the office. Our hope is that having the images reviewed will allow you to make better decisions about your treatment going forward. Kasey is the Marketing Director for OrthoIndy. She manages the in-house Marketing department responsible for advertising, strategic planning, branding, Web development, media relations, social media, government relations, sponsorships, events and graphic design for the practice and the hospital. Kasey graduated from Ball State University in 2005 with a bachelor’s degree in public relations and has been with OrthoIndy since 2006.